I have yet another Coco jumper to share today, and yet another handmade gift! Every time I make this pattern I'm amazed at how different it can look with different details and fabrics. It really is a great pattern, I don't think that you'd be able to guess that this jumper, my pineapple top and my stripy top are all from the same pattern. I made this Coco for my lovely friend's Mum, who I have known for a very long time, and who kindly gave me a bag of fabric scraps given to her by her sister who works in costume. At the bottom of the bag, there was a lovely fleecy fabric which she asked me to make here a Coco out of, after having seen my wear one of my Cocos. The pattern works with a mulitude of fabrics, and this fleece is definitely on the thicker, less stretchy end of the spectrum. To make up for the thickness of the fabric, I made the neckband wider by a couple of inches. I did that after reading this from Tilly and the Buttons, and it worked perfectly. The funnel neck isn't too bulky as I had originally feared. It's sometimes nice to go back to a familiar pattern and sew it up almost mindlessly (I have made a lot of Cocos!). As I said, I've made so many Coco tops by now that they really are a breeze to sew, and this one was no different. It has long sleeves, cuffs and a funnel neck which really makes it a super cosy jumper; the side splits also add a nice extra detail. I was actually able to give it to the recipient on a snow-day, so it felt perfect and snuggly for the weather! I think that this make was a success, and I hope that it will be well worn! 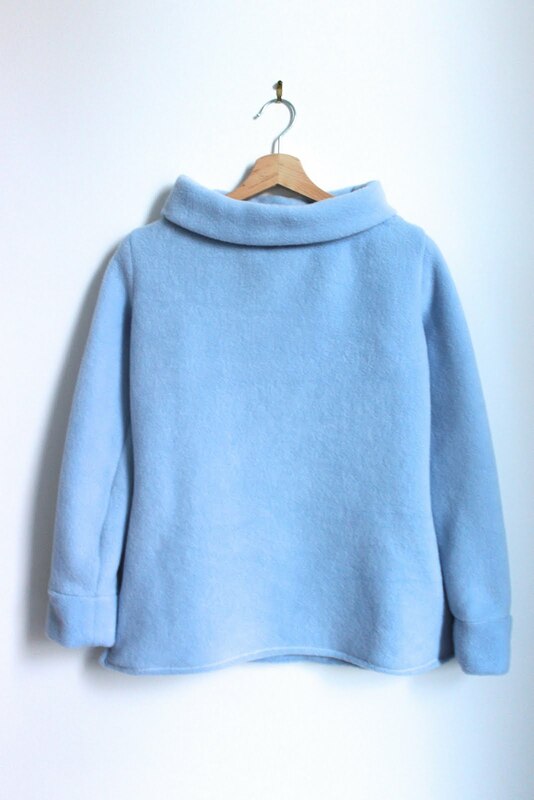 I am slightly jealous as the fabric is so soft and soft, warm jumpers are exactly what is called for at the moment. How nice of her to give you a bag of fabrics! This is a lovely Coco top. So cute and I love the fluffy fabric! What a perfect hand-made gift during the crazy cold weather we are having in the UK right now. I bet your gift recipient loved her snuggly Coco! Such a beautiful baby blue CoCo! I hope your friends mom really liked it. Oh my goodness that looks so warm and snuggly! This is such a beautiful version of the Coco pattern. The fabric is so perfect. I still haven't tried any of Tilly's patterns; this looks like a must-have. Just came across your blog. Love to see a blog by a sewer and a young one too. I have learned a lot from blogs and hope to learn from you too.